Whatever we will have going on in the future, two things are certain: there will be a record number of humans, and we’ll all be going somewhere. Mass transit will continue to get more and more important as time goes on, whether we’re talking about international travel or commuting within one’s own city. These futuristic mass transit concepts could get us from Point A to Point B in the future, so buckle up and take a ride on the possibility train. City buses have never been the sexiest form of transportation, but they get you from one place to the next. 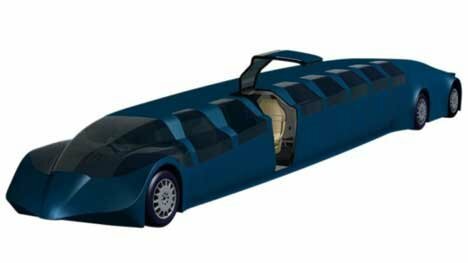 The Superbus Project aims to bring luxury, on-demand, eco-friendly mass transit to the Netherlands with a bus that happens to look a lot like a stretch limo. With 16 gull wing doors, a pile of safety features and the ability to hit speeds up to 155 MPH, this is definitely not your typical bus. The best part? You can wait inside your home for this bus since it has no set route but instead makes stops after being summoned via web or SMS. Along with the development of cars that can drive themselves has come the possibility of freeway convoys. An EU-funded project called SARTRE is based around the idea that commuters will happily give up control of their cars on the way to work in order to have a bit of free time during the commute. A lead car would be piloted by a professional driver who would be able to take control of and then release control of personal vehicles, all based on signals given by the driver. When in the convoy, the individual cars in the “train” are all controlled by the lead car, and as such their drivers can simply sit back and enjoy the ride. Riding a bike to work isn’t all that unusual, but would you consider riding this unusual pedal-powered contraption? 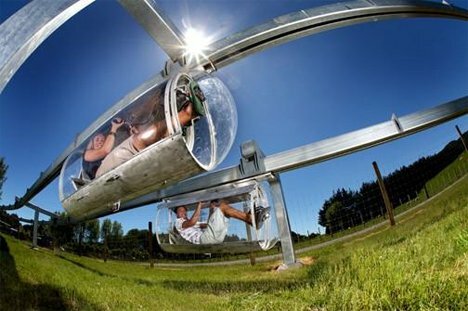 It is called Schweeb, and while it looks more like an amusement park ride than serious transportation, the concept has some fascinating possibilities. The passenger pods are carried on suspended rails and individual pods can be joined together to allow several riders to travel together (though separated by their pods). To put this system into practice in a city would require some rather extensive infrastructure installation, but the zero-emission, fitness-encouraging commuting system might just be worth the trouble. Congestion on city streets is a problem today, and chances are it will continue to be a problem in the future. This elevated bus concept in effect adds a second level to urban streets, allowing cars to pass right under it as it shuttles commuters around. Traffic doesn’t come to a halt at every bus stop and riders get an excellent view of their city. The two lane wide monster buses could accommodate up to 1400 passengers. This brilliant concept from designer Chiyu Chen incorporates two different types of eco-friendly mass transit: bikes and buses. 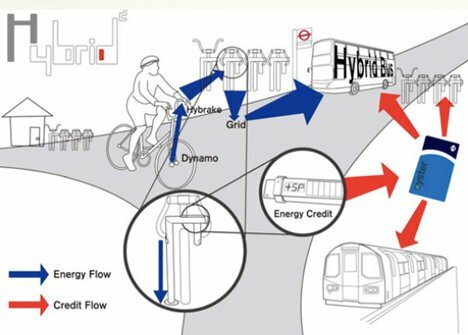 Commuters would use public bikes with interior energy-generating dynamos on some days and electric-powered buses on other days. When a commuter rides one of the bikes, she generates electricity that is stored on the bike until it is docked. The energy is then transferred to a central storage facility and used later to power city buses. Each commuter has a card showing how many credits he has earned by using the bikes. Those credits then pay for bus rides on days when the weather isn’t fit for a bike ride. As good as high-speed trains might sound in theory, in practice they involve a lot of wasted time speeding up and slowing down when leaving and approaching stations. 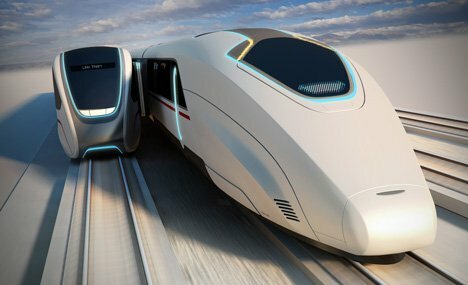 This concept would allow high-speed trains to realize their full potential by letting them run uninterrupted along their route. Rather than stopping for each station, the train would stay at top speed while a smaller local train docks alongside it to allow arriving and disembarking passengers to transfer. Designed by Priestmangoode and called Moving Platforms, this clever idea would easily shave precious minutes off of the morning and evening commutes.